No — this isn’t the surface of the moon. Or South Dakota from the sky in February. It’s the window of my seat on the airplane during a wild week of travel mid-winter. Maybe the headline of this post isn’t quite fair. Though, a few weeks ago, when I was caught in my travel time warp, there was plenty of blame I felt I could righteously direct at American Airlines. Because we can’t quite blame the weather, can we? 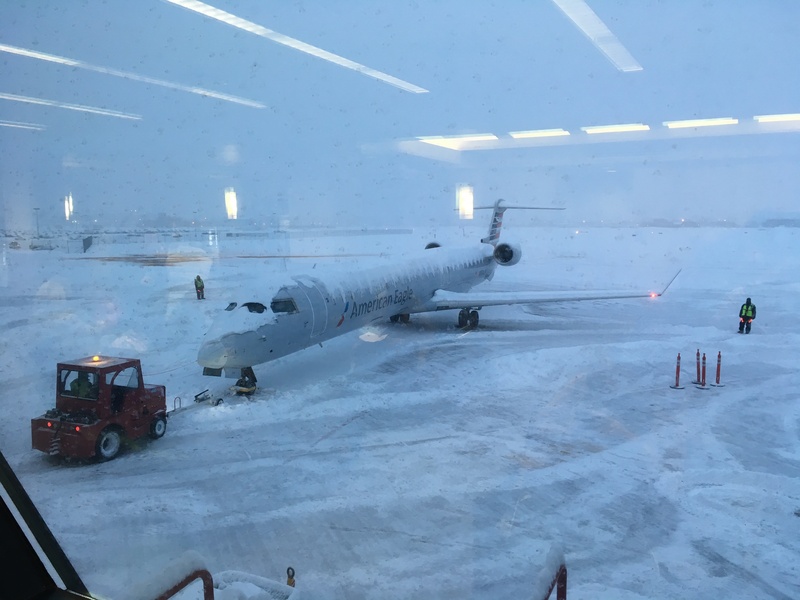 Mother Nature laughs at our attempts to fly cross-country in February, not to mention January or March. And come to think of it, she quite often orders a second helping of nachos grande and belches in our face when it comes to traveling in November, December or April as well. I’d already seen two hopeful work trips grounded earlier this year — to Toronto in January (ha! ), and Seattle in February (huh?). 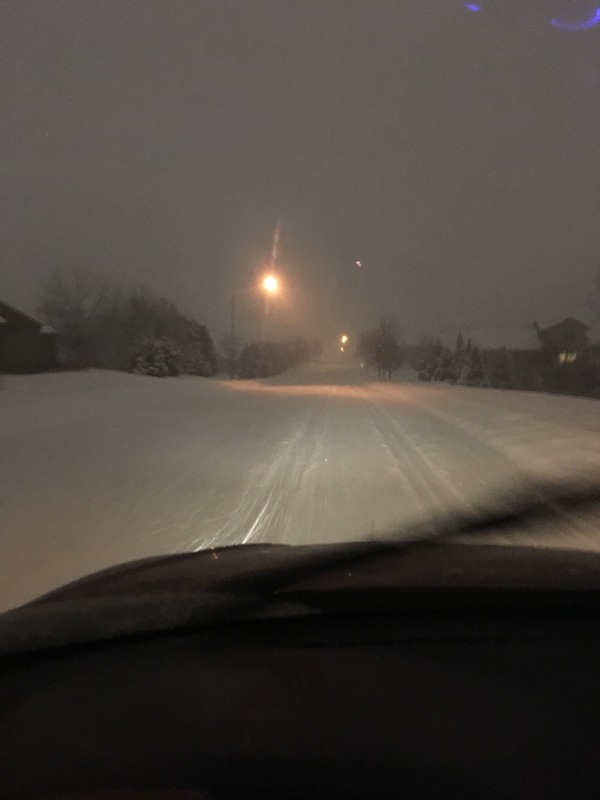 So it’s not like I was unprepared for the low odds on my mid-February trek from Sioux Falls (that’s in South Dakota, geography fans) to Nashville for a work conference. I just figured we’d have a better than average shot of hitting the right window ahead of the storm. And counted on some modicum of competence from the airline and airport staffs ushering us from point to point. I’d been keeping a wary eye on the weather the night before. 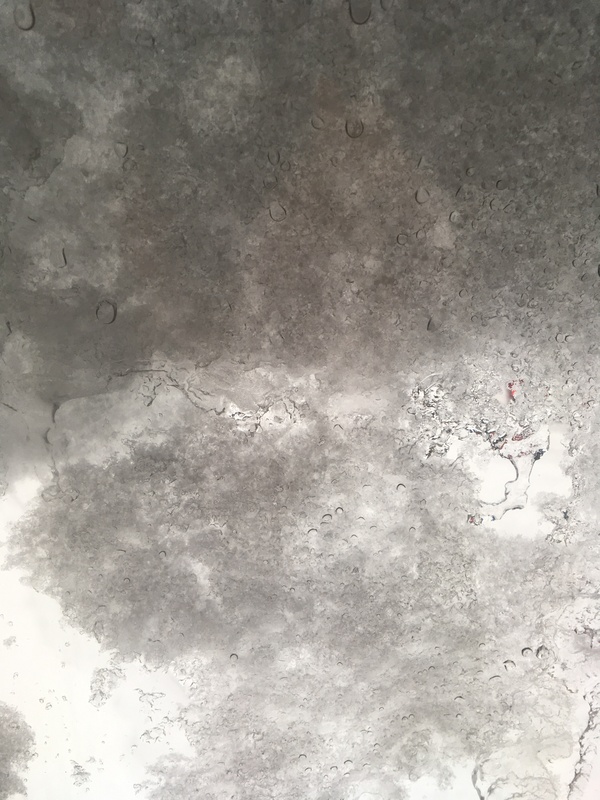 And the skies had held onto their snowy payload until — uh oh — just before bed, when I convinced myself the mere dusting of flakes on the front mat were the storm, all played out. But come my 3 a.m. wakeup call for my 6ish flight, there were 6-ish inches, and then some, blanketing the driveway and all the roads to the airport. Still, all the indicators on the AA app were green — we were Chicago-bound in a couple hours. So I tossed the luggage in the back, switched on the all-wheel drive, and slalomed my way through a sleepy city, past no more than four or so cars. The airport parking lot was an epic crossing. The wind gusting, skies still dark as pitch, dragging my bag as best as I could down the narrow tire-track paths between the drifts, getting my dress shoes in up to the ankles, hopping over the first plow tracks. The airport staff were waking up, too, and a good bunch of them were none too pleased about that. Odd little encounter at check-in that may have signified something: even though there was nobody — nobody — standing in front of the American Airlines counter, the agent there made a sour face about wanting me to use the check-in machines instead of rolling up and saying good morning and doing things hand-to-hand and face-to-face. Okaaaaaaay. But I was soon on my way and polished off a quick breakfast. All signs still green. Hopped aboard even as the machines dug and scraped outside and the windows stayed caked in ice. True, we were headed to that Chicagoland Triangle of lost itineraries, O’Hare, but the storm was some 500 miles away from them. What could delay us, being one of the first flights out? We were on board and had our window. But we were soon offloaded. 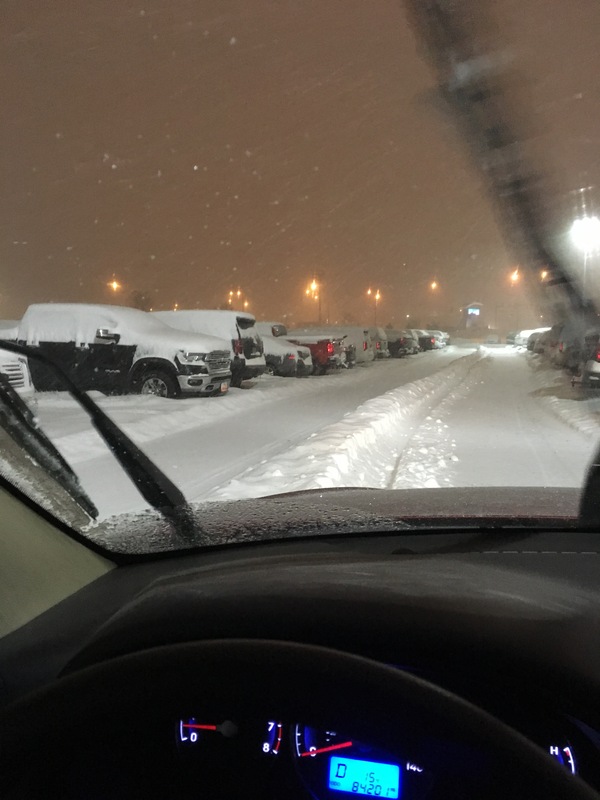 And marched back into the terminal where many of us wondered — would we, could we even get out today as the storm worsened and dumped its payload eastward. I was pretty lowkey and confident at first — I had all day to get to Nashville, basically, though afternoon sessions beckoned. But as my fellow passengers converged en masse on the gate agent, I stood off to the side and tried AA on the phone. The situation got weird — though not unprecedentedly so — as the screen first broadcast a delay of two hours, then our flight disappeared entirely from it. Weirder: the AA agents on the phone showed our flight as having taken off, so there was no help coming from them — what could they do about rescheduling when all their systems showed us as already on our way to the Windy City? Echoes of my odd first encounter that morning. Who was training these people? And how much had they been drinking at the time? My off-again, on-again flight from Sioux Falls to Nashville, doing what it did best: back away from and back to the gate. As it turned out, our best, and oddly accessible source of information was the stranded flight crew. Our pilot shared the calming, confident news that he had personally seen to our imminent departure. Apparently, O’Hare air traffic control had taken a look at the map that day, and the weather on the way, and decided they could live without our little jet coming in from Sioux Falls. The flight was officially cancelled. But, our savvy pilot squawked back at them that, hey: you cancel this flight and you lose a plane for the next four or five on the schedule that day. He convinced them to get us back on the flight board, but it apparently took close to two hours to get things unkinked in the system. As we were barked at repeatedly to sit down, and stand out of the way, and given no other answers for at least an hour before the pilot’s helpful news. When it came time to reboard, the computer systems were responding to all that negative karma: the gate agents had to check us in, one at a time, since we’d all been checked out of a previously cancelled flight. Huh. Newly printed boarding pass in my hand, I repeated the filing-on process from two hours before, and settled in to almost my same seat, and sunk into a grateful nap. Touching down, I was prepared for the usual O’Hare scramble: just about 20 minutes left to catch my departing connection to Nashville. 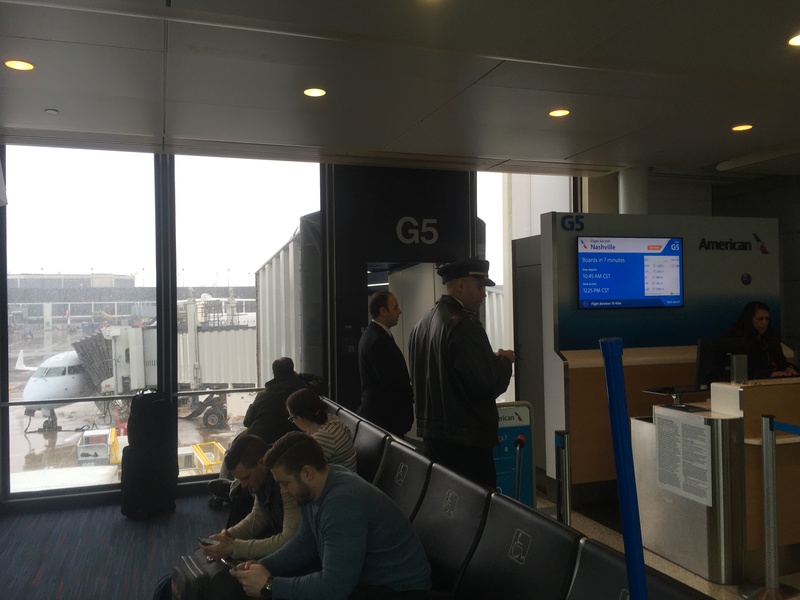 Until I studied the boarding passes more closely: my arrival gate, G5, was the same as my departure gate, G5, and the plane that had been cancelled and then resurrected from Sioux Falls was the same plane I was going to have to (somehow) take to Nashville from Chicago. So, all was well that ended, well, two hours later. But man, the ruffled feathers and ham-handed incompetence of the gate agents when, hey, don’t they see this every week? Every other day? The byzantine, but ultimately benign, turns of my day of travel certainly kept me entertained. Maybe that much drama just isn’t for them? My arrival gate in Chicago, same as my next departure gate. And the plane everyone had been waiting on there, was the plane I got right back on. Stroke of luck on a weird, wintry day. I thought I’d out-hustled Mother Nature in my planning for the return leg. But, you know how it is by now, with the endless orders of beefy, supreme nachos, and the belching, and the flagrant flatulence: she’s a tougher customer than we give her credit for. Nashville had been deluged by days and days of rain. Flash-flooding. School cancellations. But I figured I was on the high side of it since I’d planned on not heading back right away Saturday morning at conference’s end, but to stay for the weekend till late Sunday afternoon, visiting with my brothers and their families. All seemed on a blissful right track. The skies cleared. The sun came out Sunday. I walked outside — outside! — for the first time in months, and marveled at the budding trees. Sunday morning drifted into a lazy afternoon and my brothers, Dan and Sam, and I, caught a great burgers and bourbon lunch at a trendy spot in downtown Franklin as preamble to ferrying my cookies to the airport. And that’s when my AA app began to make trouble. My connection in Chicago, this time, was safely sitting at the gate hours before my scheduled arrival. But the trouble was in clear, blue-sky, sunny Nashville. 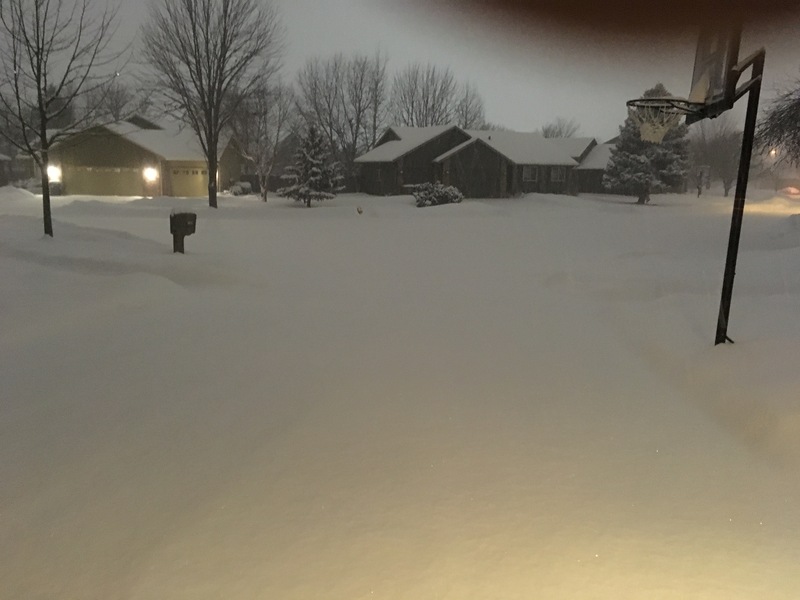 I was going to get out on time here, but likely looking at an overnight in Chicago as the bulge of delayed flights worked its way forward from a week of headaches. I started to play with rescheduling on my own. But I figured — still, somehow — talking to a person really in-the-know from American Airlines, on the phone, would be my best bet to work through the tangle. By the time they got back to me, later Sunday options had vanished, as had Monday. And I was looking at late Tuesday options. On the phone, the outlook was worse. They told me — after the usual awful, awful, awful ridiculous preamble about not being able to offer me any flights on other carriers, and telling me of no options I could pay for — that the earliest option they had was Wednesday and that one was going, going gone. Helpfully, I pointed out, that I was supposed to be flying American AGAIN on Wednesday, this time to Dallas, and wouldn’t it be awful if American couldn’t get me home in time through Dallas this time to turn right back around and go to Dallas? Unhelpfully, they responded they could book me into Dallas from Nashville for that leg of my trip (still FOUR DAYS LATER) and connect me home on my original return flight from that Dallas trip. So I hung up on the unbroken streak of customer service incompetence and made my own way. On the app. And on the computer. I snagged a Wednesday (Wednesday!) return first, then gradually worked my way back to Tuesday a couple hours later, then Monday. And eventually, on our way to dropping off Dan’s son at kindergarten Monday morning, snagged an earlier return flight Monday morning so I’d be home for dinner. A day late, but home. I won’t say my experience is out of the ordinary. And that may or may not be a problem. More likely, it’s inevitable. But the theme here that just dumbfounded me, still, is just the lack of human grasp from the company in charge — American Airlines — of how to get the best information and relay it helpfully, kindly, humanely to paying customers. Mother Nature, we know, is a belcher and farter. But we depend on the humans in customer service to, well, treat us like customers, like humans, to serve. 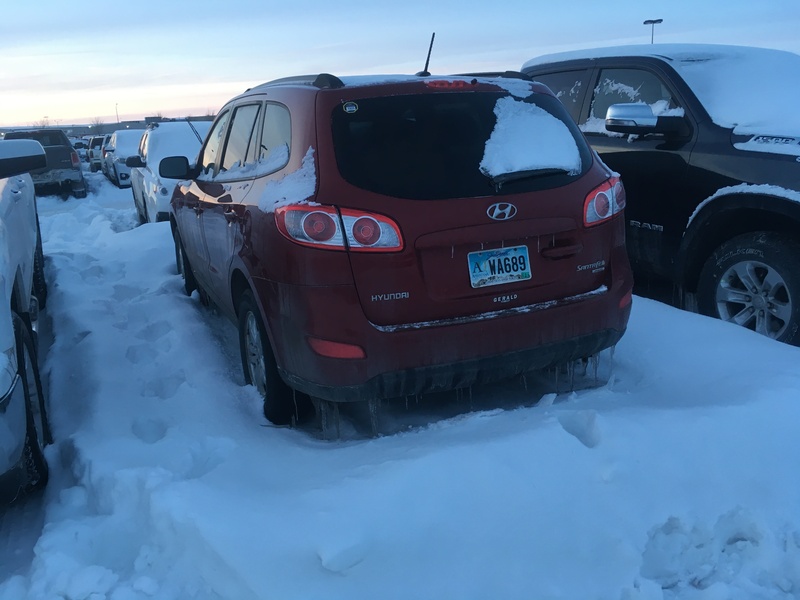 Kicker to the trip was the half hour to get my baggage at our tiny little airport, followed by the intense dig out from the snow moat surrounding my car on all sides, and the broken credit card machine lanes at the parking lot exit. Karma’s way of saying, hey, happy trails. Insult to injury: the moat of snow and subzero temps welcoming me back home. Still: there’s no place like home.